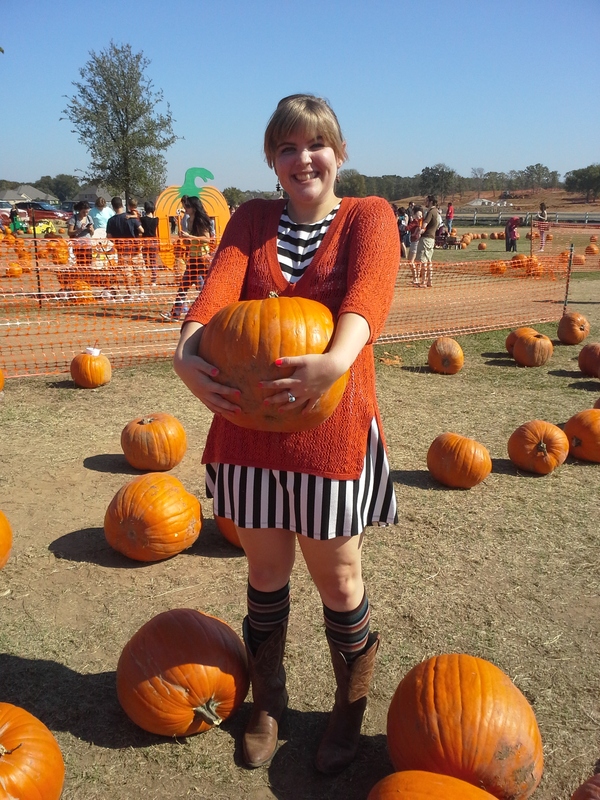 This might have been one of my favorite days of this month, because it was FILLED with pumpkins. 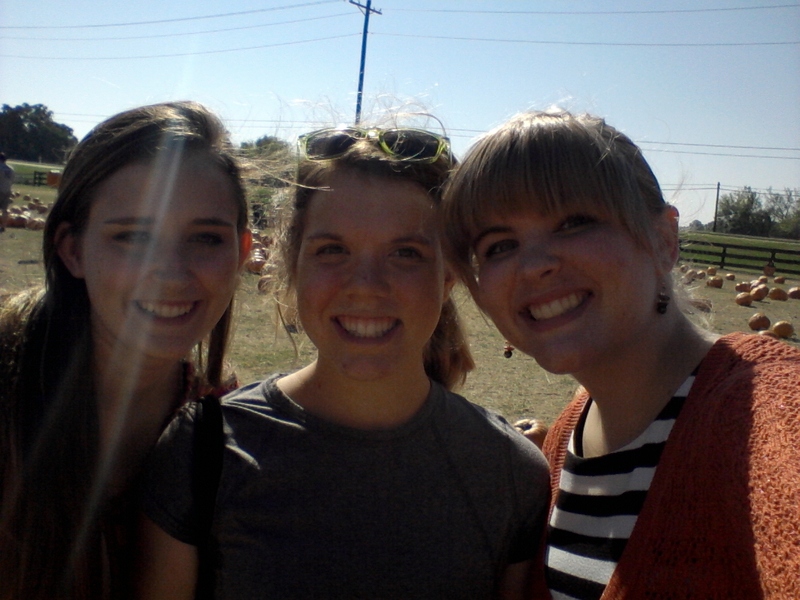 Alexa, Joanna, and I went to a pumpkin patch today to find the perfect pumpkin for our dorm room. Yes, we could have gone to Walmart and it would have been much cheaper, but this way was much more fun. 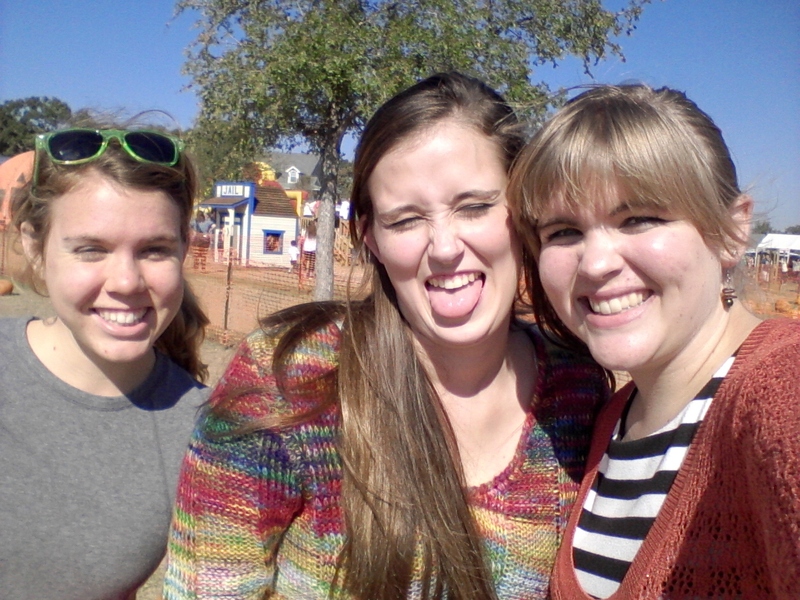 Yes, we were the only people at the pumpkin patch who did not have children. No, we did not care. We started the day off right with pumpkin spice cappuccino with pumpkin spice marshmallows, pumpkin spice bread, and spiced pumpkin pie Clif bars (#whitegirlstatus, at least we didn’t get our pumpkin spice from Starbucks!). I think I might be obsessed. I think I don’t care. 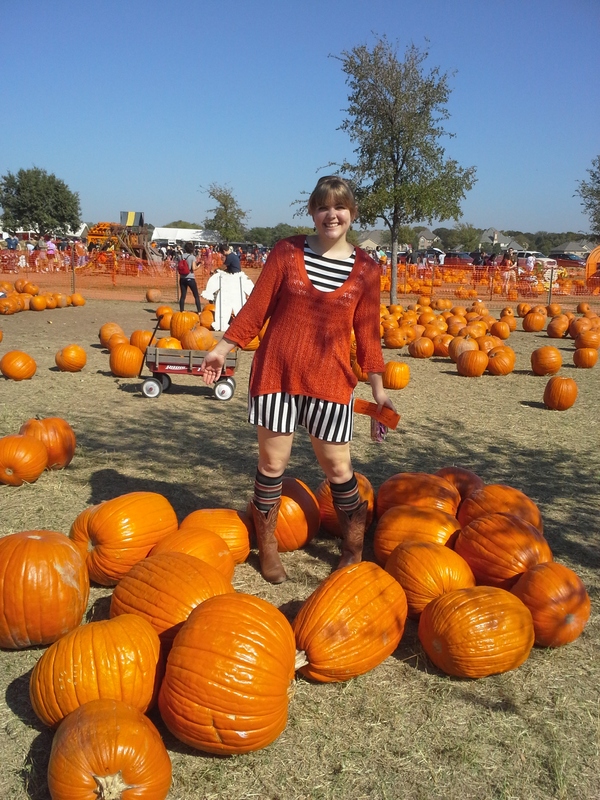 Then we drove to Flower Mound Pumpkin Patch (it was so cute!) to find the perfect pumpkin. It had to be small enough to go in our dorm room, but not super tiny. It also had to be short and squat, because that’s the perfect pumpkin shape. It took a little while, but I found it. We also got two tiny pumpkins (like super tiny) for only 50 cents each. I made an adorable presentation on top of the organizer in our dorm room, but I can’t get a decent picture until the light stops shining in so brightly from the window. Stay tuned for that. 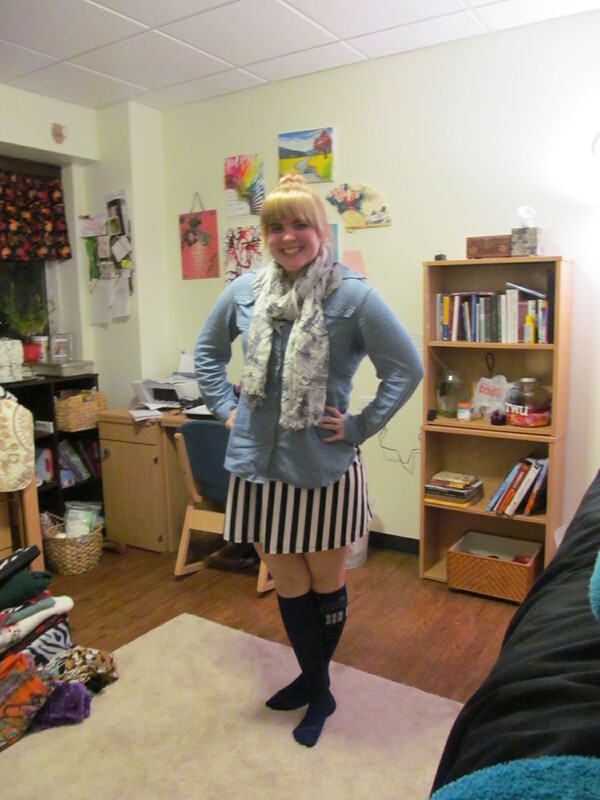 With The Dress I wore my orange sweater, my striped knee socks, and my cowboy boots. We tried to take a picture before we realized that the sun was behind us and our faces were way too dark. Oh look, we are actually able to take a cute picture! So I am very pleased to announce that I did fantastically on my March Goals! I had almost $200 saved before I received birthday money, but afterwards I was able to put in a total of over $400!! I am getting so close now! I can hardly wait until June! I was REALLY worried about English because of on grade that I got on the first paper I wrote, but I worked really hard and ended the class with an A! I actually got a 100 on the research paper, which is a really big deal for me, because I often make small grammar mistakes that cost lots of points. I was able to keep up with this for the first couple weeks of March, which was great! 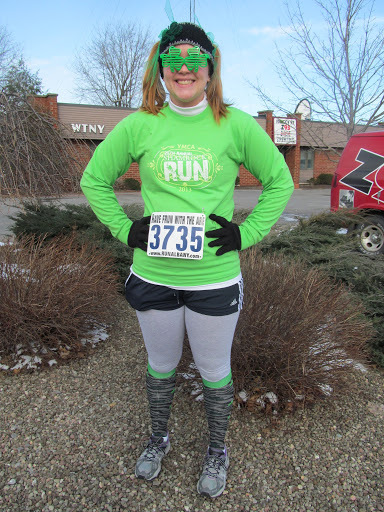 Then I ran my first 5 mile run for St. Patrick’s Day, which was super fun! Unfortunately, because I wasn’t used to running that far, I got minor shin splints in my leg, and I had to take a break for the next couple weeks. But I’m better now and will go back to running this month! Do you like my St Patty’s Outfit? The socks are my favorite! 4) Get on top of blogging! No more of this blog after the fact! I am not a football person. I don’t understand it, I don’t particularly enjoy watching it, and yet I go to the Super Bowl parties. Why? Because I am a social person and I like to eat. Yesterday was no different. I went to the on post youth group’s Super Bowl party, and I had a blast! However, because I am not a football person, I had no idea who to root for, and thus what to wear. I obviously do not have a team jersey I can wear! Someone had told me that the two teams were red and purple, and my mother had the fabulous idea of wearing both! 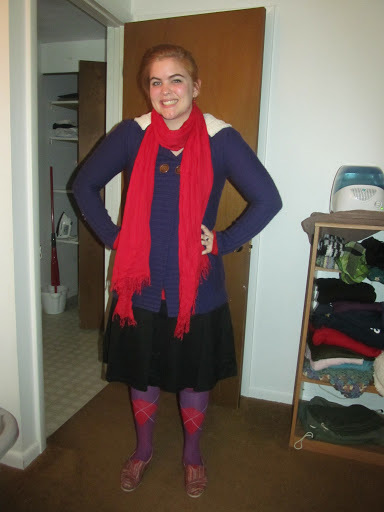 I am wearing a red long sleeved top, a purple sweater, a black skirt, red tights, purple knee-high socks with red triangles, my wool multi-colored TOMS, my red scarf, and a purple ring that is way too big for any of my fingers so it kept falling off. This picture was taken before I had earrings on, but I was also wearing cute little ladybug earrings. 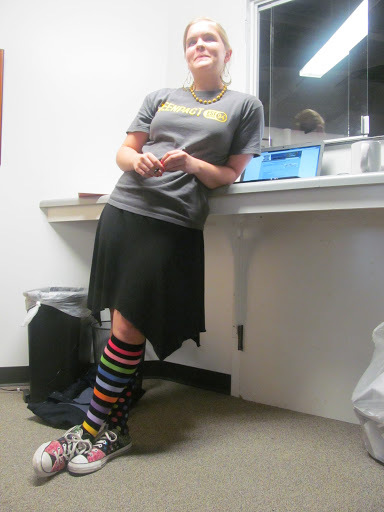 And thus whichever team won, I could technically say I rooted for them by wearing their team colors. 🙂 I also made cookies, because I can’t go to a party without making something sweet and they were fabulous, if I do say so myself. I found the recipe on Pinterest (I’m addicted). They were cookie dough on the bottom, then a layer of oreos, then brownies; baked at 350 for 35 minutes. SO RICH. SO GOOD. But be warned, take these somewhere because if you leave them home you will eat them all and gain 20 pounds. I’m not kidding, they are addicting. Hello Everyone! 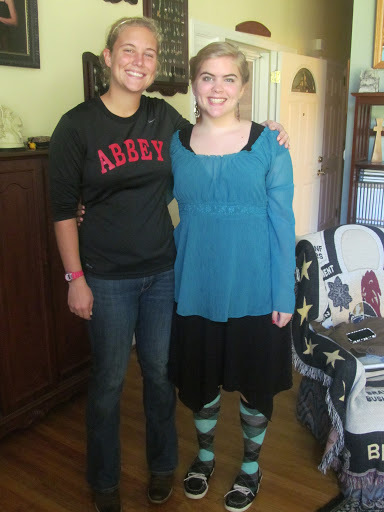 My sister’s home from college! 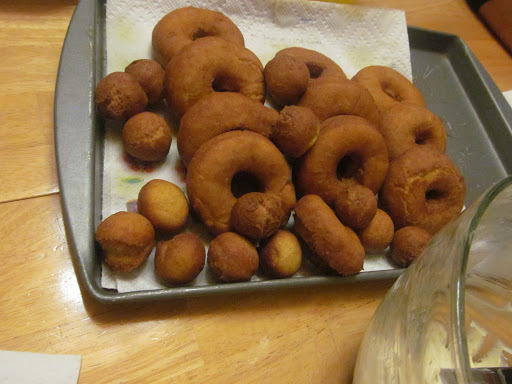 Plus my grandmother is in town and my dad’s on a retreat so we celebrated by making pumpkin donuts! Anyways, we were going to go to the fair today, but unfortunately all the parking was full so we couldn’t go. 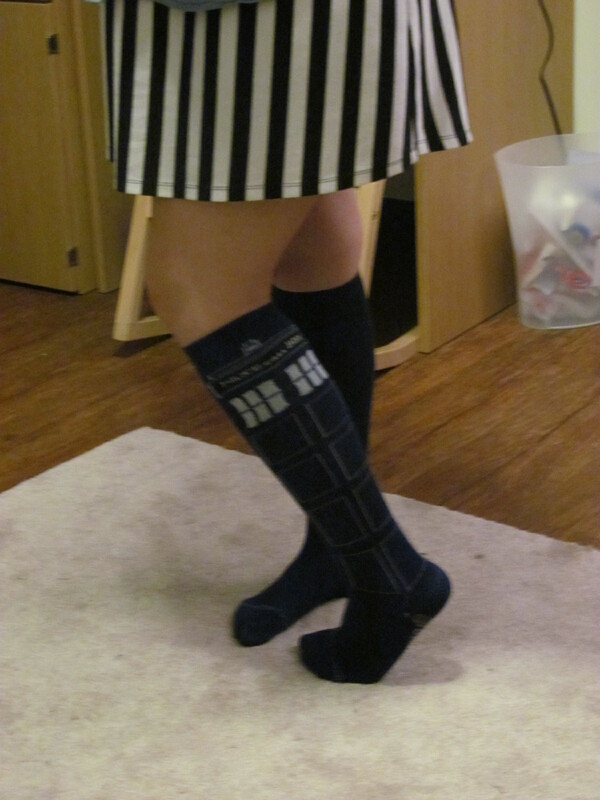 So today I wore the dress, a teal top over, teal and black knee high socks (I love socks!!) and black flats. I ended up taking it off early though because I didn’t want to get grease on it from the donuts, which were delicious. Anyways, today was another babysitting day, so I wanted to be functional but fun. I also didn’t have very much time to get ready so it doesn’t go very well together… I’m wearing The Dress, my TeenPact shirt (yes, I’m a proud convert), a necklace my sister got me in Rwanda, mismatched knee-high socks (see my post about socks here), converse from my Grandma Sharon, and earrings that I actually bought full price (shock and awe, I know)! What are your thoughts on Day Eleven? 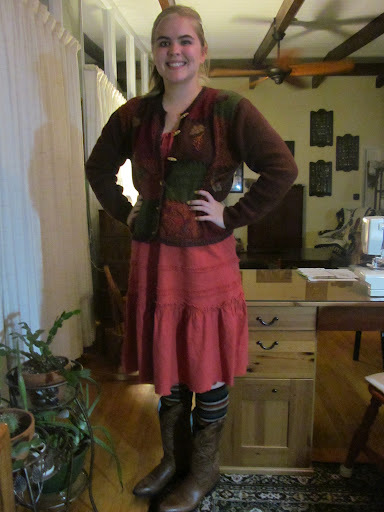 As you can see, I’m wearing a long skirt as a short skirt (see my post about that here), my fall sweater, my fall colored knee-high socks (see my post about that here), and my cowboy boots. I’m so excited for fall! 🙂 What are your favourite ways to wear fall colours?